Is Sleep Apnea a Major Culprit in Car Accidents? You are here: Home / Car Accidents / Is Sleep Apnea a Major Problem in Causing Car Accidents? Is Sleep Apnea a Major Problem in Causing Car Accidents? An estimated 70 million people in the United States suffer from a sleep disorder and 12 million of these individuals have OSA (Obstructive Sleep Apnea). According to Everyday Health, driving fatigue accounts for at least 100,000 accidents per year. About 71,000 of these crashes result in injury and 1,550 end in tragic death. The National Sleep Foundation also conducted a survey where 20% of the respondents said they had fallen asleep at the wheel at least once in the previous year. Too little sleep and too much alcohol have similar effects when behind the wheel. These dangers include a slow reaction time, moodiness, aggressiveness, diminished alertness and impaired judgment and vision. Seek help from a doctor or professional. If you are suffering from lack of sleep, get evaluated to see if you are dealing with sleep apnea. Stop and rest. When you begin to feel drowsy and tired, pull over immediately. Don’t wait until you fall asleep and have a accident. Think before you drive. Make sure you are alert enough to be behind the wheel. 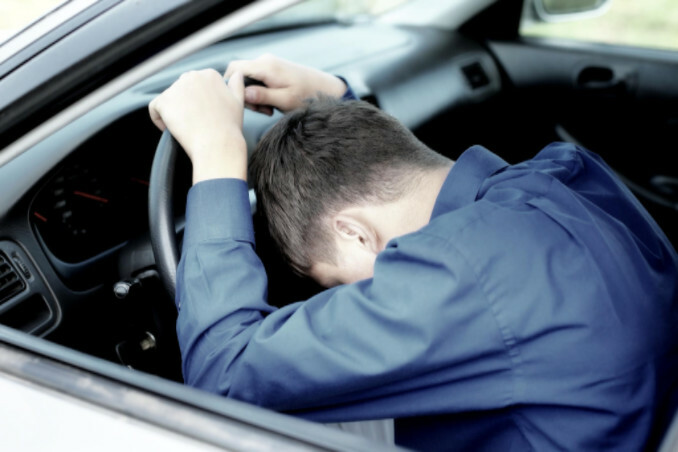 It may be an inconvenience but you shouldn’t get behind the wheel if you feel drowsy. Drink caffeine. Caffeine can take 15 to 20 minutes to kick in, so if you know you are sleepy and will be driving drink something that will help give you a kick start. Don’t ignore the signs that you should not be driving if you are too tired. Take care of yourself and others on the road.